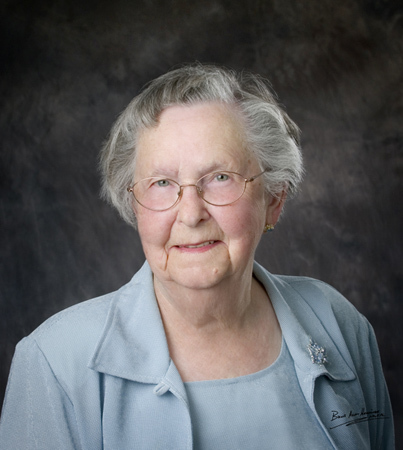 Mary Eleanor (Simpson) Swanson passed away peacefully on February 12, 2019, in Neepawa, Manitoba, at the age of 102 years. Eleanor was born September 24, 1916, at Shoal Lake, Manitoba, to Hector and Lena Simpson, the eldest of five children. She was predeceased by her parents, husband Frans, son Clare, brother Francis, sister Marion Ishenberg, and grandsons-in-law Matthew Frost and Rob Keenan. She is survived by her son Hector, daughter Shirley (Herb) Schellenberg, and daughter-in-law Heather Swanson; grandchildren Lorena Barriere (Noel Barriere), Karen Schellenberg (Sean Neville), Trevor Swanson, Diana Keenan, and David Schellenberg; great-grandchildren Eleanor, Christopher, Simone, Jamie, and Sophia. She is also survived by her sister Dorothy Cook, brother Charlie Simpson, and many nieces, nephews, cousins, and friends. Eleanor was always very active. She and Frans operated a grain and livestock farm in the Brookdale community, progressing from horses to modern equipment. Eleanor was skilled at baking, sewing, knitting, and quilting; her hands were continually busy. Her handiwork has been featured at quilting displays, and her grandchildren still wear the sweaters and mitts she knitted. Eleanor and Frans travelled often to the West Coast, and made an epic quest to Sweden and Scotland in 1973. She served on many community organizations, including UCW, 4H, and President of the committee that published the Brookdale area history book "Quest for Roots". She enjoyed dancing, card games, and curling (was an honorary member of the Brookdale Curling Club), and in her later years watching curling on TV. After Frans passed away in 1992, Eleanor moved to Neepawa where she continued her handiwork and made frequent trips to Winnipeg to visit family. Many thanks to nurses and staff at the Neepawa Hospital, the Palliative Care volunteers at the Hospital, the Home Care workers, ambulance personnel, and doctors, for their loving care. In lieu of flowers please consider a donation to the Neepawa District Palliative Care Service (Box 1240, Neepawa, MB R0J 1H0) or a charity of your choice. Cremation has taken place, and a private family interment will be held at a later date in Brookdale. White’s Funeral Home, Neepawa, in charge of arrangements.